RAM expansion for the Amiga 500 which connects to the side expansion slot and supports up to 8MB of additional RAM. 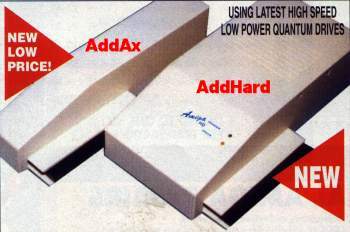 The unit also had a through-port so that other devices could also be plugged into the side of the A500. Depending whether you bought the unit with 2, 4 or 8MB of RAM it was called the AX502, AX504 or AX508, all of which are exactly the same device.